While the focus of football fans is at the 2018 World Cup finals that have now reached the knockout stage, tennis enthusiasts around the world are eagerly anticipating the start of the 2018 Wimbledon Championships, the 132nd edition of the world-famous tournament. Main draw starts on 2nd July and with a total of £34 million up for grabs in prize money, chances are we will witness some memorable matches between this Monday and 15th July, when the competition ends with men’s final. With 8 Wimbledon titles to his name, veteran Roger Federer has again been made the number one favourite for the coveted title as the world number 2 is priced at 7/4 to go all the way. Fallen giant Novak Djokovic comes second at 5/1, whereas clay court specialist Rafael Nadal can be backed at 7/1 to win only his third Wimbledon trophy. Marin Cilic (7/1), Andy Murray (12/1), Alexander Zverev (14/1), Nick Kyrgios (16/1) and Milos Raonic (18/1) are some of the underdogs tipped to reach the final stages. When it comes to the women’s tournament, two-time winner Petra Kvitova leads the betting at 4/1, followed by former world number 1 Serena Williams and reigning champion Garbine Muguruza. Women’s tournament always tends to produce plenty of surprises, meaning it could pay off to back one of the long shots such as Maria Sharapova (16/1), Caroline Wozniacki (25/1) or Venus Williams (33/1). 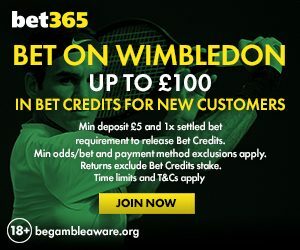 If you are looking for a perfect place to test your Wimbledon knowledge, then you should definitely place your tennis bets with bet365. The UK firm offers a plethora of outright, in-play and pre-match betting markets, while they will be live streaming Wimbledon matches worldwide with the exception of USA, Sweden, Norway, Italy, Finland, Germany, Switzerland and Austria. The live stream service is free of charge for all customers with funded accounts as well as those who have placed a real-money bet in the last 24 hours.